MP for Belfast, 1852-66; Solicitor-General, 1858-9; Attorney-General, 1866; a Lord Justice of Appeal, 1866-68; Lord High Chancellor, 1868 and 1874-80. Sir Hugh was elevated to peerage, in 1867, as Baron Cairns, of Garmoyle, County Antrim. His lordship was advanced, in 1878, to the dignities of Viscount Garmoyle and EARL CAIRNS. ARTHUR WILLIAM, 2nd Earl (1861-90), who wedded, in 1887, Olivia Elizabeth, OBE, daughter of Alexander Augustus Berens, by whom he had issue, a daughter, LADY LOUISE ROSEMARY KATHLEEN VIRGINIA CAIRNS. Hester Margaret; Ursula Helen; Sheila Mary; Catherine Olive. MY STORY of the noble family of Cairns commences at the ancestral seat of the Marquesses of Downshire, Hillsborough Castle, in County Down. During the first years of the 18th century, Ulster became a harbour of refuge for a number of Scottish refugees who arrived in the years immediately following "The Fifteen". The major Jacobite Risings were called the Jacobite Rebellions by the ruling governments. The "First Jacobite Rebellion" and "Second Jacobite Rebellion" were known respectively as "The Fifteen" and "The Forty-Five", after the years in which they occurred (1715 and 1745). It is likely that the Cairns family arrived in Ulster about this period. Among the records at Lord Downshire's seat, Hillsborough Castle, County Down - most likely now held at PRONI - were the registers of leases and the rent rolls of the Kilwarlin estate. One lease of three lives, dated 1716, was granted to William Cairns. It is probable that William Cairns was a younger son of William Cairns of Kipp, who died in 1711. The lease to William Cairns of 1716 was of the lands of Magheraconluce, near Annahilt, County Down. He died prior to 1735, when his widow appears as the tenant, and he left several sons, who became tenants of farms in the neighbourhood. 2. HUGH (1735-1808, who died at Parkmount; By his will he left several legacies to his "kinsmen at Annahilt", and £600 to each of his six sisters. He left Parkmount, which he acquired shortly after the death of William Gregg in 1782, to his half-brother Nathan, whose mother had been a daughter of Mr Gregg. He states in his will that "most of my property consists of money lent out at interest on security", from which it appears that he was one of Belfast's early private bankers, some of whom eventually amalgamated, thus founding what became known as the Northern and Ulster banks. 3. WILLIAM, born in 1737. The name William Cairns continues to appear as holder of the Magheraconluce property subsequent to his father's removal to Belfast after his second marriage. 4. Margaret, Sarah, Colville, Ellen, Jean and Mary, who all died without issue. William Cairns, of Magheraconluce, married, secondly, about 1758, Agnes, daughter and heiress of William Gregg of Parkmount, Belfast. This estate seems to have passed to Mr Gregg from the representatives of Thomas Lutford, who had a lease for three lives, renewable for ever, from the Marquesses of Donegall in 1769. Some time after his marriage with Agnes Gregg, William Cairns appears to have moved with his family to Parkmount, or to a house at Carnmoney. His father died in 1775 and the widow, Agnes Gregg, surviving him and dying in 1785. Both are interred at Carnmoney churchyard. WILLIAM CAIRNS, of Parkmount, born 1789, who entered the army and became a captain in the 47th Regiment. He married, when only 17, Rosanna, daughter of Hugh Johnston, a merchant of Belfast. During his father's lifetime he lived at Rushpark, near Carrickfergus, and also had a house in Belfast, which stood in the grounds now occupied by the Robinson & Cleaver Building, Donegall Square North. After his father's death, he moved to Parkmount, which he shortly afterwards sold to John McNeill, a banker in Belfast. Parkmount, on the Shore Road, was in 1666 a lodge or occasional residence of Lord Donegall, and it afterwards passed into possession of Ludfords, Cairns, and McNeills. John McNeill's son notably sold Parkmount to Sir Robert Anderson Bt. When William Cairns sold Parkmount, he eventually lived at Cultra in County Down, possibly to Dalchoolin House. He married secondly, Matilda, and died at Cultra in 1844. The Rt Hon Hugh McCalmont [Cairns], Earl Cairns, of Garmoyle County Antrim, was born at Cultra, educated at Belfast Academy and Trinity College, Dublin. Lord Cairns married, in 1856, Mary Harriet, eldest daughter of John McNeill, of Parkmount, Belfast,by whom he had five sons and two daughters. His father at first intended that he should take holy orders, but his own inclination, backed by the advice of his tutor, the Rev George Wheeler, decided to permit his son to enter the legal profession. Lord Cairns and his family left Ulster. The Cairnes family, since the Reformation, were all originally Presbyterian. The 1st Earl's great-grandfather, or some of his family at least, seem to have conformed to the Established Church shortly after their removal to Parkmount. Certainly John and his father William subscribed to the Vicar of Carnmoney as early as 1775. First published in February, 2011. Cairns arms courtesy of European Heraldry. 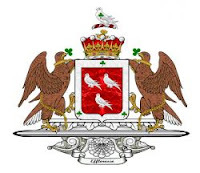 I notice the Earl Cairns have the same family crest as the Brady family who are descended from the Right Reverend Hugh Brady, Bishop of Meath from 1563 to 1584, namely "A Martlet Arg., Charged With A Trefoil Slipped Vert." Hugh Brady, the first Protestant Bishop of Meath, is the ancestor of Sir Maziere Brady, created a Bt. in 1869. His Crest is described in Burke as " a martlet or, charged on the breast with a trefoil slipped vert". As you know "or" means gold and "arg" silver, so the Bradys and Cairns have similar crests but not identical.